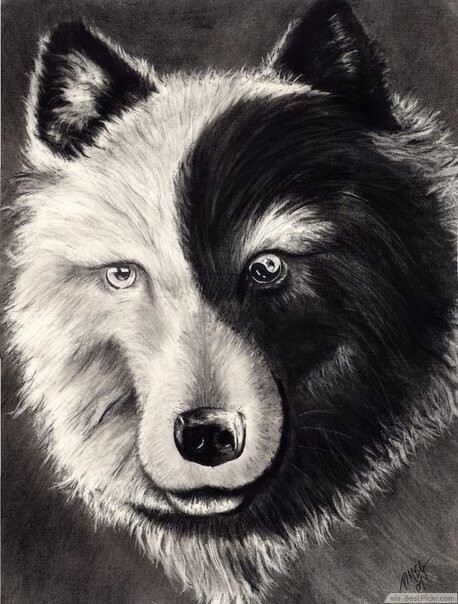 Inspiring animal art for inking and photo-realistic shading - a friendly, calm wolf's face, half in black, half in white. 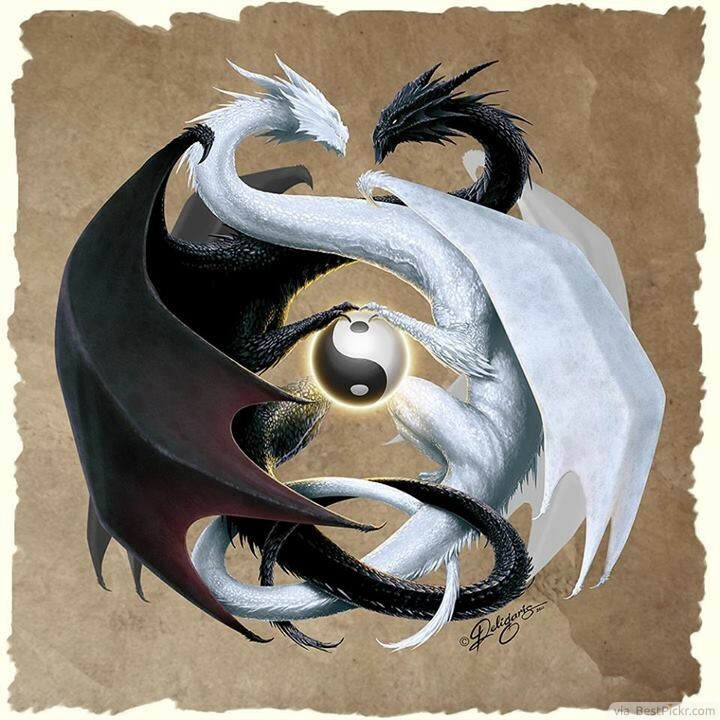 Incredibly cool painting of two dragons (ash black and snow white) in harmony holding the glowing sphere of Yin Yang symbol in the center. 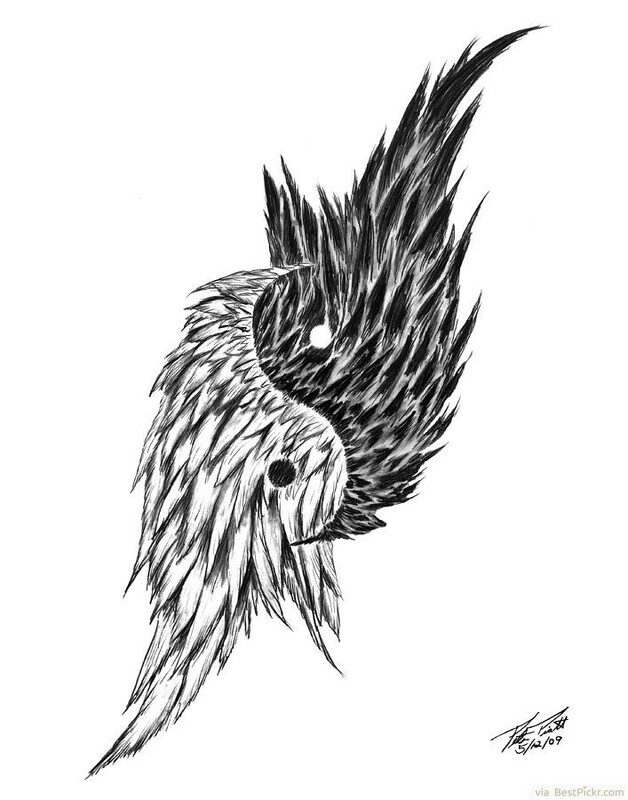 Amazing abstract black and white feather wings tattoo idea for men and women, it’s masculine and feminine the same time, ya’ll absolutely love this design on upper arms, shoulder or back. 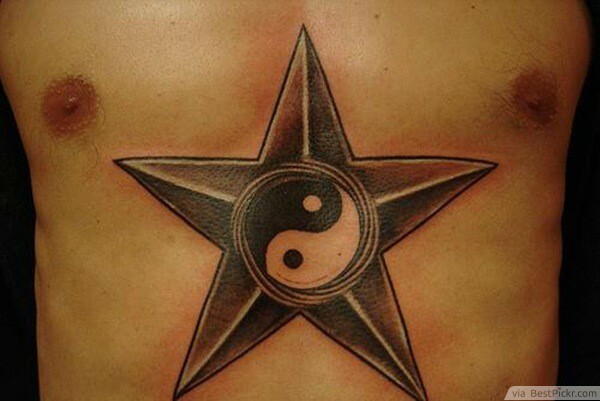 Great for military personnel, to show courage, strength and protective power. very cool idea for small size marking. In vintage warm summer colors with dark and light shades, very feminine design for girls with dragonflies, heart shapes, plants, and butterly. 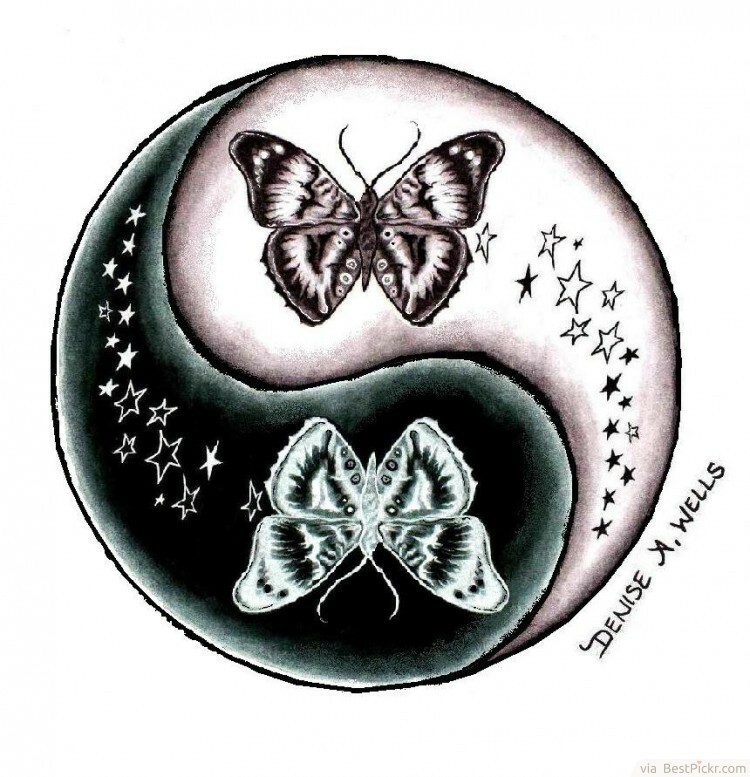 This tattoo idea signifies the complementary forces of Death and Life, Earth and Sky. 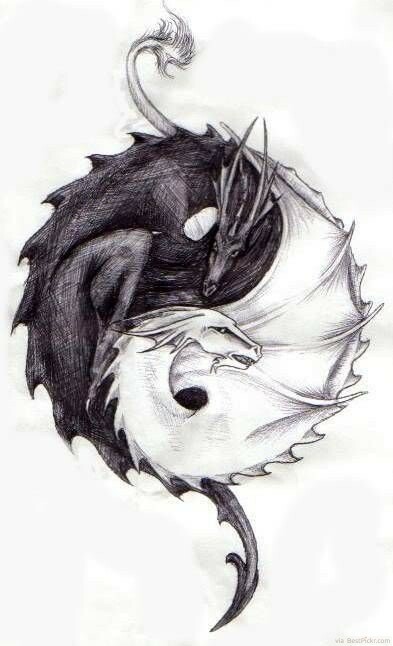 The killing dragon of Death in black and the healing Dragon of life in white, perfect for shaded tattoos for girls. 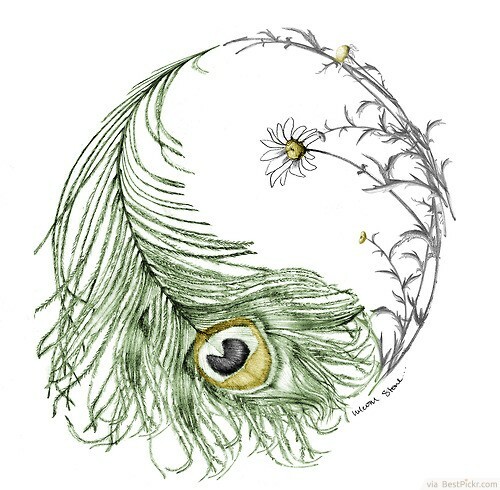 Delicate and pretty drawing of a green peacock feather and white flower in the shape of Yin Yang, perfect as feminine tattoo idea inspiration for women. 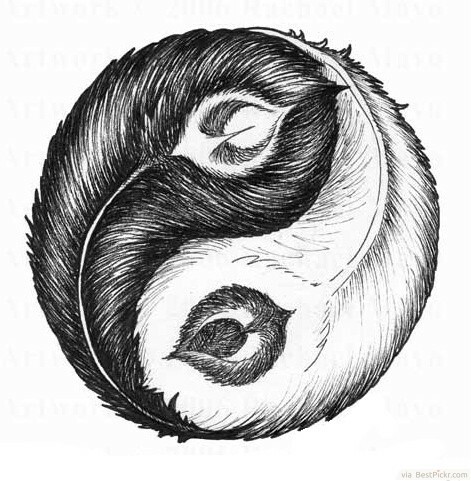 Two birds in subtle black and white feathers, with big eyes, perfect illustration for tattoo or as paining for interior decoration, to bring balance between Night and Day. 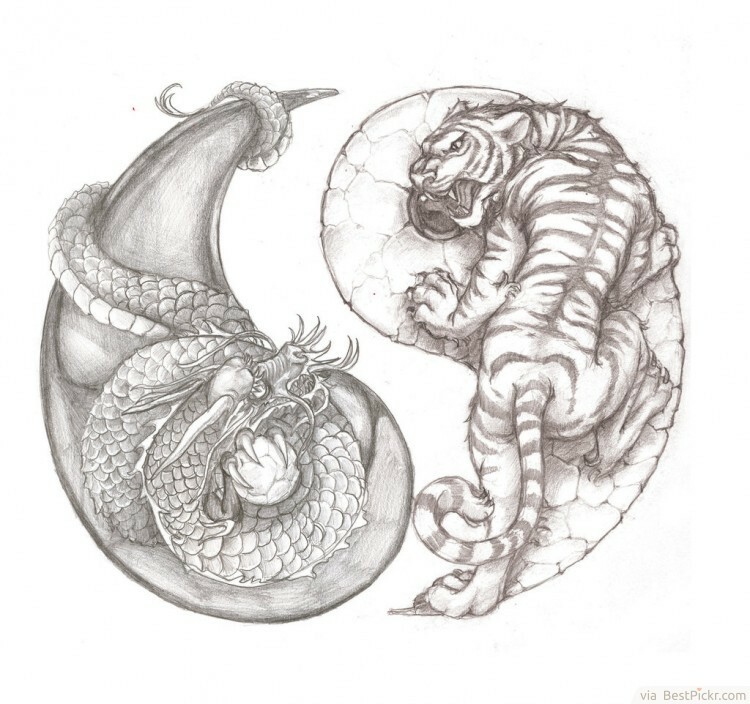 Fearsome roaring tiger against the all mighty dragon in this traditional Chinese Yin and Yang art concept pencil drawing. 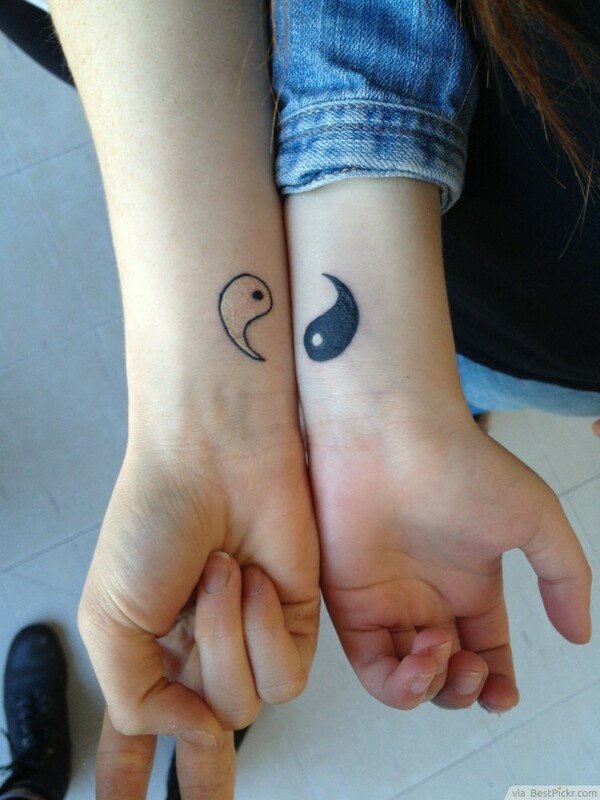 Perfect inspiration for matching tattoos with your best boy or girl friends. 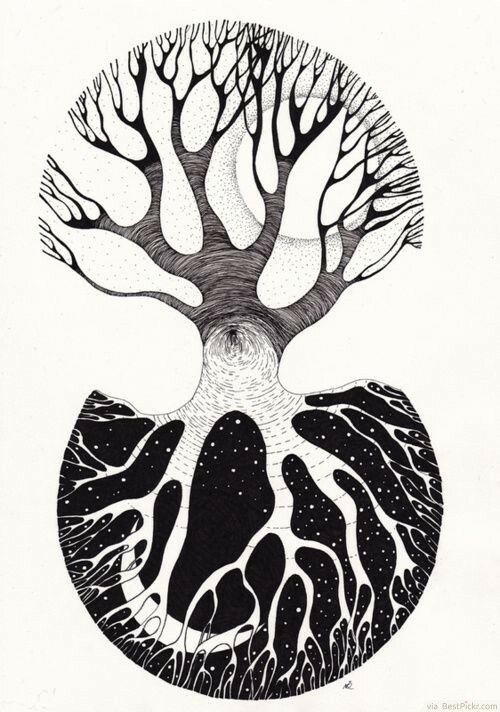 Breath taking, incredibly beautiful, almost whole body yin yang tattoo design depicting a tree of life in a gorgeous story telling artwork. This cherry blossom tree separates two worlds, one is in hot Summer time, full of light and sun's heat, in bright yellow and warm orange colors with red burning Sun. The other is Winter, cold, with Northern lights, dark blue sky, mountains, pine trees and large Moon in starry night sky. 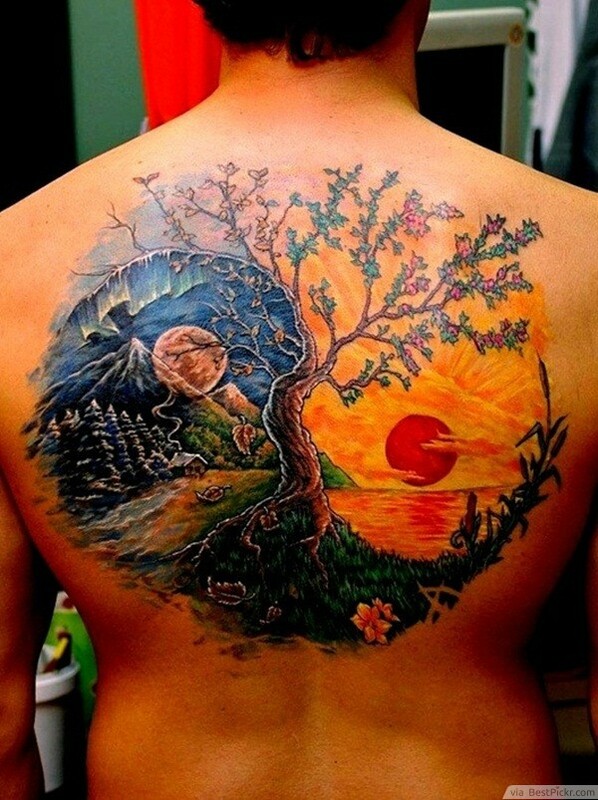 It has sunrise and sunset and looks likes fairy tale fantasy world painting tattooed on the upper back of the body. 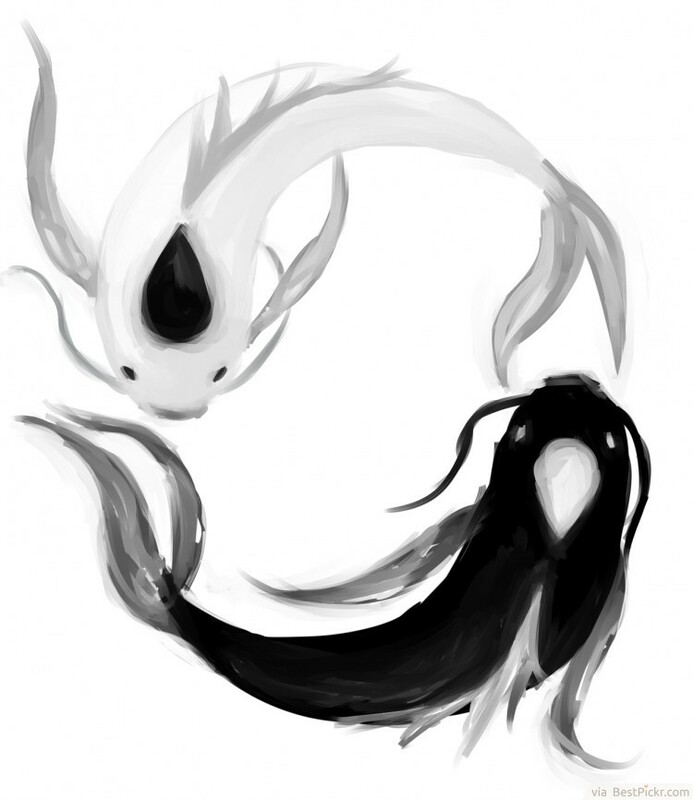 Beautiful cool koi art, with very soft brush strokes. Feminine, intricate and light. 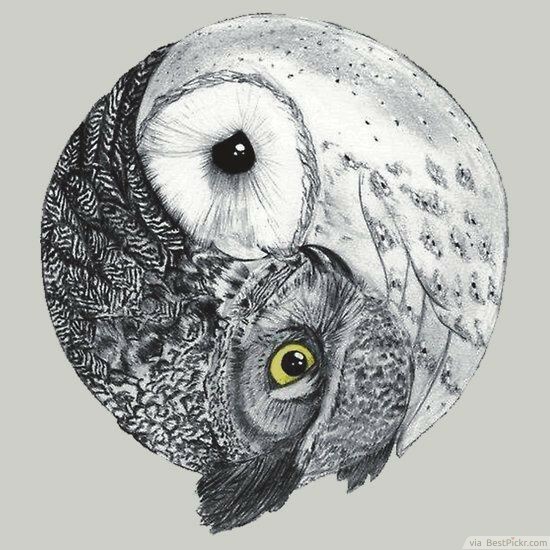 I'm feeling a relaxed mood, at ease, very peaceful and tranquil by just contemplating this painting. 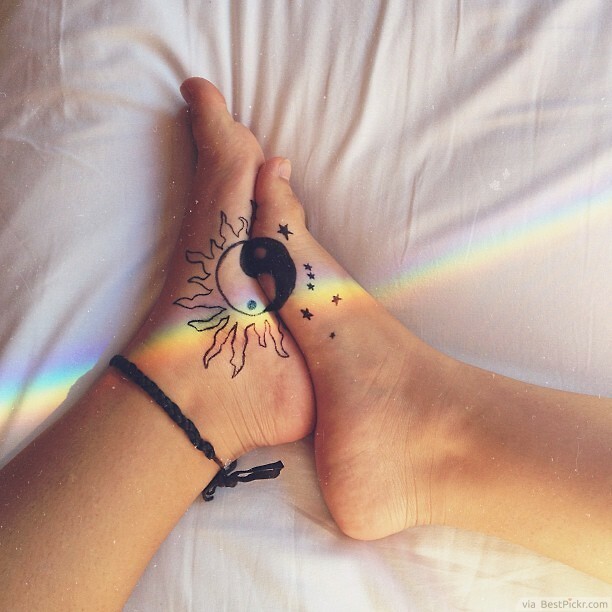 Great matching tattoo idea for yourself or with others you love, with perfectly balancing positive energy from the heat of the Sun during hot day and negative cooling energy from the Moon during cold night with stars. 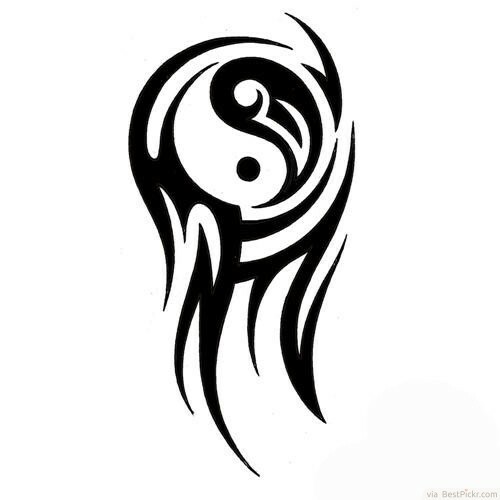 Very masculine design for guys in the army or Navy, on the chest - a symbol of fortune. 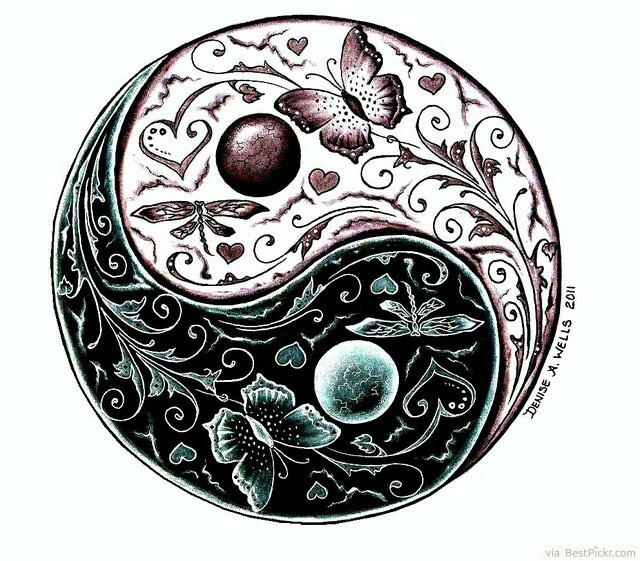 I love strong straight lines and shading combined with soft rounded curves of the Feng Shui circle, making it appear like superman sign with unlimited power and strength within, balancing the Passive and Active core. 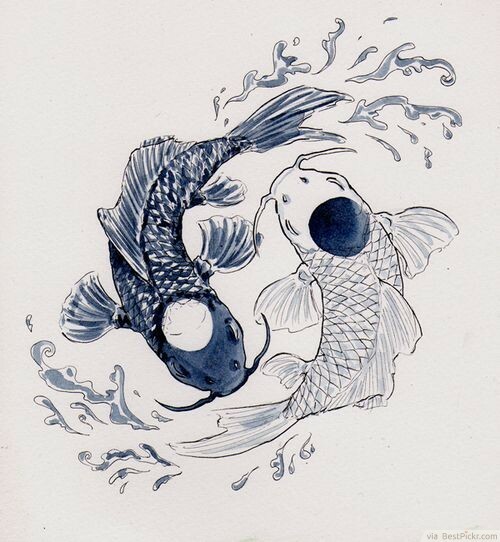 Beautiful classic black and white koi painting of two fishes swimming in opposite directions, signifying Matter and Spirit, perfect as large tattoo on the back of the body. 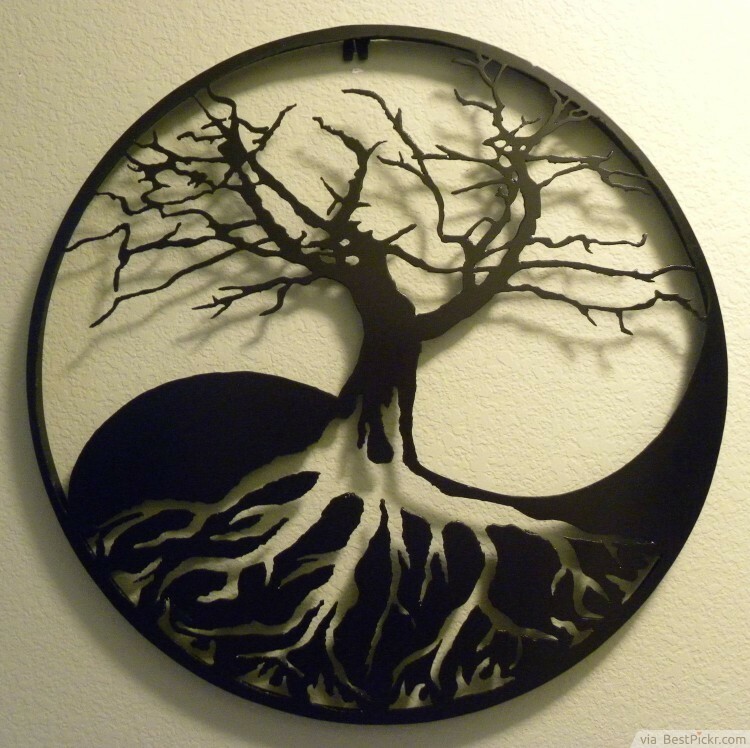 Great black ink tree tattoo design for both men and women, in balancing day and night with Sun rising above and Moon falling below, in doodle artwork style. 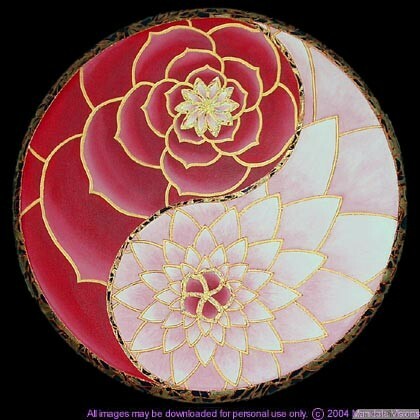 Another charming and pretty pink flower idea with black and white Feng Shui circle in the middle representing the perfect harmony of matter and spirit in your inner feminine nature. 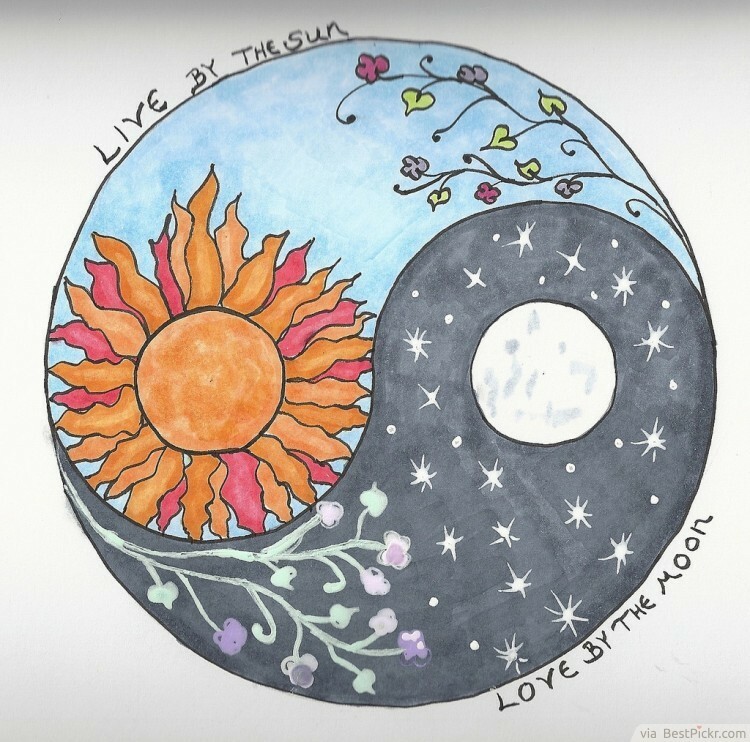 In cartoon style we have hot orange sun with cold white moon, in light blue sky morning glory and dark night with stars. 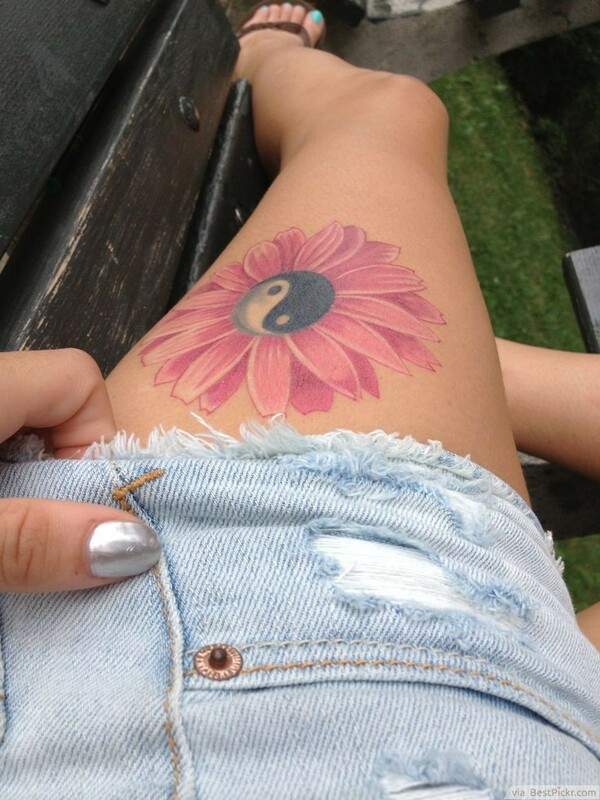 Great nature tattoo idea for women. 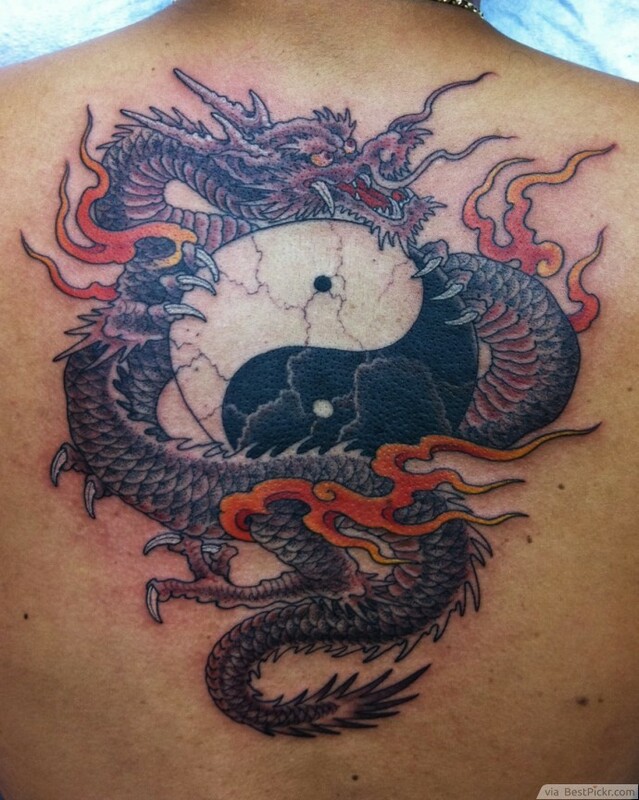 Totally wicked, I love this work of ink, great for fighters or warriors. 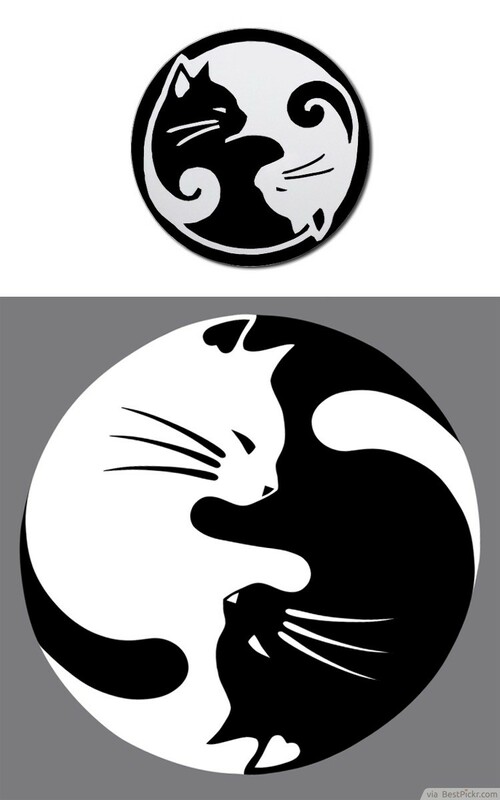 The burning red fire and the dark black reptile scale go really well with the symbol in the middle, reminds me of Mortal Combat series. 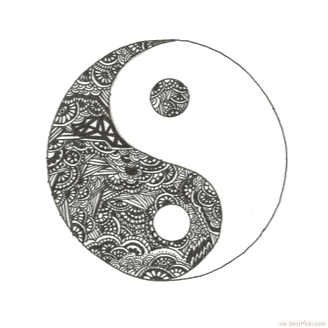 Beautiful and black and white outline drawing of henna scroll pattern, lovely design for girls. 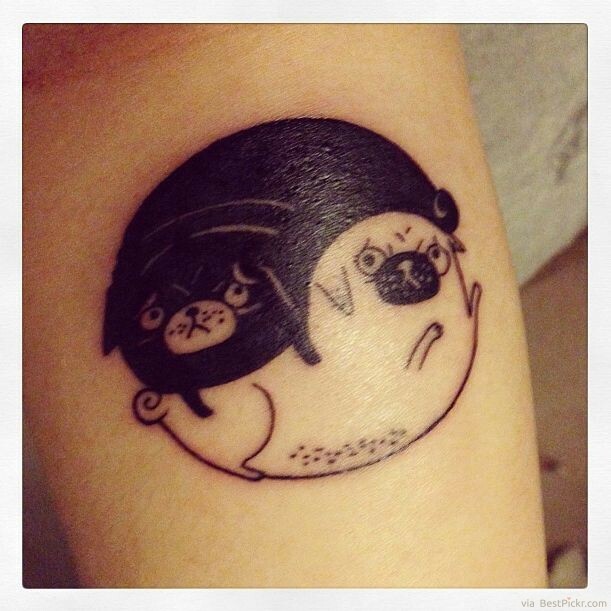 The Tao of Pug awesome ink idea by artist Gemma Correll - for those of you looking for something different and unique on arms or shoulders, a point of conversation with friends. 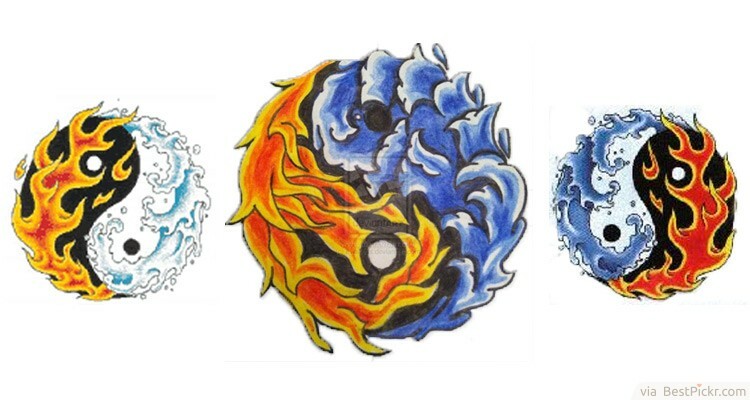 Positive and negative forces swirling within the whole in perfect balance of Hot an Cold, fire and water elements in this colorful art, good idea for your gang, bikers and people who love leather jackets. 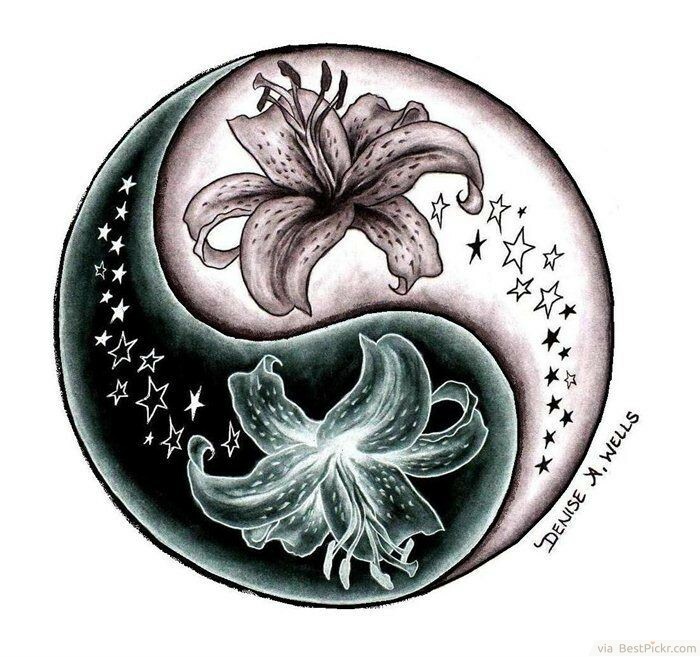 Very cool black and white tattoo idea for soul mates or to remind you of best friendship and harmonious relationship between the two of you, in Oriental style. 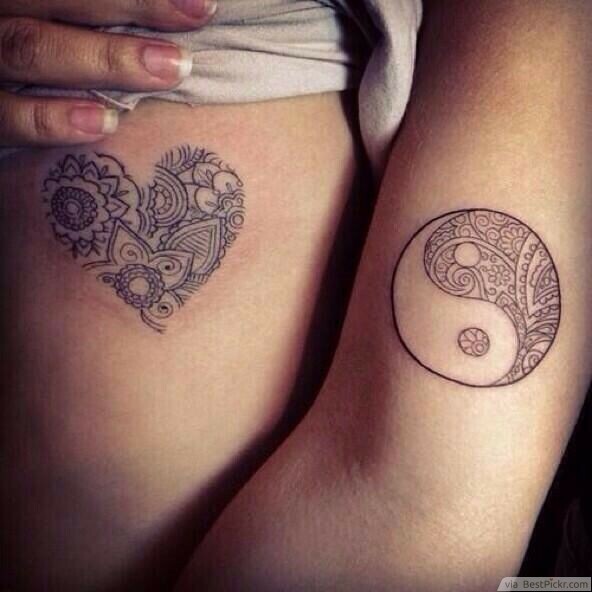 The feminine Yin for her and the masculine Yang for him. 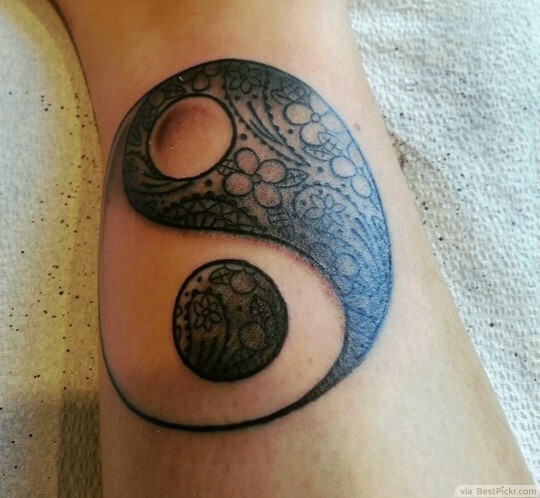 Love this heart and yin yang design, they go together really well with that floral pattern and thin black lines.